“Gi Me Da Weed” is the first single from Bigga’s highly anticipated upcoming release titled “Sak Pase” on Walkup Records, due out in the coming months. The long awaited album – his first since Binghi Mon – promises to build on the reputation Bigga has made for himself and has a few surprises in store as well, featuring legendary drummer and member of the Rock and Roll Hall of Fame, Jerome “Bigfoot” Brailey (Parliament/Funkadelic) and members of the Ruff Stuff band whose recording credits include Robert Palmer, Sly & Robbie, Shinehead and Burning Spear, and who have backed such reggae greats as the late Dennis Brown, Sean Paul, Freddie McGregor, Sizzla, and Morgan Heritage. “Gi Me Da Weed” is already being played on reggae stations nationwide and gaining a strong momentum. Bigga is known as the first Haitian singer to break into the Jamaican reggae scene, and has been credited as an influence on many of today’s hottest reggae singers, including fellow Haitian artist Wyclef Jean. He recorded two singles in Jamaica for Freddie McGregor which were released in the U.S. on RAS Records. 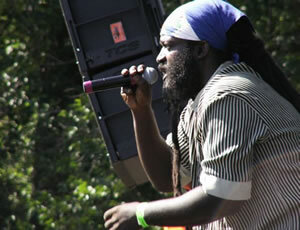 He has also recorded tracks with artists such as Yvad, Ken Boothe, and Denroy Morgan of Morgan Heritage. Bigga Haitian’s Walkup Records debut, “Gi Me Da Weed” is out now at iTunes, eMusic, Napster, Rhapsody, and other online music stores.